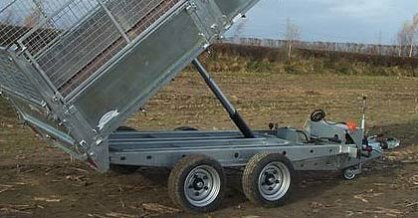 The Graham Edwards tipping trailer range is up to 3.5 tonnes, up to 12' length and up to 6' 6" width. Builders,builders merchants, landscape gardeners, local authorities, farmers, if you have bulk deliveries to be made, we have the tipper for you. Our basic tipping trailers are very well equipped but a large range of optioal extras are available for our tippers. This includes sign writing, tarpaulin covers, ladder rack, coupling lock etc.